"Oh my gosh I am soooo excited! Thank you so much! This piece of art means so much to me. 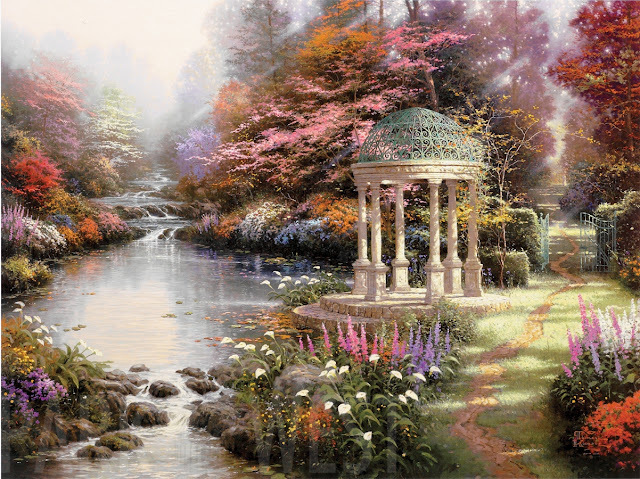 I saw Thomas Kinkade on TV talking about this painting and that the person at the end of the path could represent God or a special person in your life. My mom died suddenly last March at the age of 60. When I saw Mr. Kinkade talk about this I knew I wanted this piece of art. I voted almost every day and prayed I would win this. The person at the end of the path is my mom. Thank you so much for this." Thank you for sharing this touching personal story with us, Tina. You could win your favorite Thomas Kinkade work of art in Park West Gallery's Vote for Your Favorite Kinkade Contest, just like Tina did! Park West Gallery randomly selects one winner every Friday and you can vote once per day. The Park West Gallery Art Team Was Fantastic!